Al Aan TV celebrates its 10th anniversary. Dubai, November 2016: [Source: Al Aan] Al Aan TV has celebrated the 10th anniversary of its launch, where they marked the past 10 years delivering real entertainment and real news catered to the family households in the region. 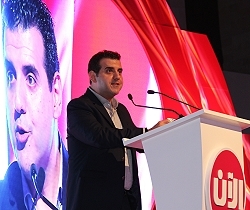 The anniversary celebration sought to mark a decade of catering to the demands of a modern, socially connected Arabic audience. The whole occasion was themed around the channel’s new strategy ‘Because You Matter’ – with the anniversary event comes the announcement of the strategy for the coming year ‘Because You Matter’, that falls under Al Aan’s continued audience-focused approach of delivering tailored real entertainment and real news. The 10-year celebration party sought to showcase a number of key Al Aan initiatives including its mobile-based news website www.akhbaralaan.net, which features areas including Arabic, regional, world, exclusive, special reports, breaking news, sports, business, female related and light entertainment. The site follows Al Aan’s crowd-sourced approach to media, building on advanced technologies that allow editors and SM publishers to contribute towards writing articles, pushing it to social media from within its CMS. The event also announced the launch of the Nojoom Bila Hdood programme, which is a pioneering project and the first of its kind, which involves social media and TV in one competition. The talent-based project aims to make Al Aan viewers shine, helping them to achieve their dreams of being TV and social media stars. The show will culminate in one winner being crowned. The programme is aimed at delivering a strong TV presence, growing a social media base to create a new star that is both a TV and a social media celebrity. Not only does Al Aan support aspiring individuals to achieve their dreams, Al Aan TV earlier announced 8th August as Hope Day - an annual event which will spread the message of hope on the TV screen. On this day a Syrian War drama ‘Amal’ was launched to spread the message of hope and positivity to homes across the region. Hope Day will continue to be an annual event which promotes hope and positivity for everyone. The encouragement of talent by Al Aan is expressed through other initiatives such as Al Aan Premier, a brand new division launched as part of Al Aan TV which focuses on working with start-ups by providing them with brand-new solutions. Al Aan Premier allows entrepreneurs and start-ups in the region to gain the exposure they never considered having before, by reaching out to mass audiences in the region and working together with the brands on achieving their goals. Crowd sourcing also extends to TV series such as the soon-to-launch Amal S3 – which will be wholly scripted according to Al Aan TV viewers’ opinions received through its social media outlets. This collective public script-writing will draw on viewer’s creative ideas, as well as involving them in the production phase, as they can send in entries, with the best chosen to win. Al Aan’s social media channel has a significant fan following of over 13M on Akhbar Al Aan Facebook, over 1M on @akhbar Twitter, over 125K on Instagram and over 6M Al Aan Facebook. Tailoring its content to the on demand adaptation that the public now seeks, the organisation is set to launch its Al Aan Play website, which will offer a video on demand platform. Fans of HD episodes will be able to watch their favourite programmes like Amal and Basmati at their convenience, which is sure to provide a popular destination for alaan.tv visitors.